Opened in 1992 and renovated several times since then, Foxwoods Resort Casino is one of the largest casino complexes in Connecticut and maybe even in the whole of the United states. Up to 2012, it actually was the largest casino complex in the world it terms of its playing area and the number of slot machines. Belonging to the Pequot Mashantucket tribe, this complex has everything one could need for accommodation, amenities and games of chance. Recently it joined the group of casinos open to online players. More details follow in this review. Foxwoods Resort Casino is situated in Ledyard, a small town of just over 15 000 inhabitants, in the State of Connecticut (North – East of the United States). Built after the American government legally recognised the Pequot Mashantucket tribe in 1983, the complex opened its doors to the public for the first time in 1986. At that time it was just a large bingo hall. Over the years, it was enlarged and renovated several times: in 1992, from 1994 to 1997, from 2002 to 2003 and then from 2005 to 2008. Now it covers a total area of 840 000 square metres including two tall towers and offering 2 266 rooms and hotel suites. As well as the accommodation, the complex also has a two storey building just for arcade games for children and teenagers, a large shopping centre (Tanger Outlets Foxwoods) with 85 shops selling luxury items, several casinosand restaurants along with other amenities. Foxwoods Resort Casino has 6 different casinos covering a total area of 32 000 square metres completely dedicated to cash games. This includes more than 5 500 slot machines and more than 380 gaming tables. Among these are several versions of European and American roulette, Blackjack, Baccarat and Craps tables. Other games that are popular in Asia like Pai gow and Sic Bo are also available. One can also play Keno and the large Bingo hall can hold up to 5 000 players. For poker fans, several tables are open in the evenings with versions such as Texas Hold’em, Three Card Poker and Crazy 4 Poker among others. 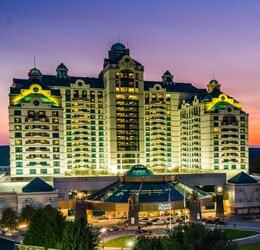 And just like any great casino, Foxwoods Resort Casino also has a Big Wheel, which is situated in the main tower. In January 2018, Foxwoods Resort Casino signed an agreement with the developer Authentic Gaming. Specialising in the development of Live Roulette tables direct from real land based casinos, this developer looks after of the live streaming of games from one of the complex tables. Six 4K HD cameras ensure that online players will experience the real atmosphere of the world’s 5th largest casino. Accessible by the public since the 4th of July, this live roulette table is available in Authentic Gaming’s online casino partners such as Lucky31 Casino, Casino Extra and Dublinbet.